Nintendo Selects highlights a variety of great games at a great price, including this one. For the first time ever, Nintendo has created a four-player Mario game set in a 3D world. 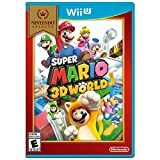 The game, developed by the same team that created Super Mario 3D Land for Nintendo 3DS and the Super Mario Galaxy games for Wii, lets up to four players play as Mario, Luigi, Princess Peach and Toad. Each character has his or her own unique characteristics, and people can play cooperatively or competitively. The new cat transformation turns characters into adorable felines that can scratch enemies and even scamper up the flagpole at the end of levels. Clear warp pipes add some new puzzle elements to game play. The new cat transformation allows players to run on all fours, pounce on enemies, attack in midair, or use their claws to scamper up walls and goal poles. Explore colorful 3D environments filled with obstacles and contraptions like transparent pipes and vertical conveyor belts, which add new puzzle elements. Use the Wii U Gamepad Controller's touch screen to search for hidden blocks and freeze enemies in place.